Cracks password for Microsoft Access database instantly. Publisher's profile: TriSun Software Inc.
Changes: Supports adding mdb file by drag-and-drop. Uses Golden Ratio for the main interface and its start position. Supports Win8.1 and Win10. Supports checking the new version (includes manual and automatic). And more. 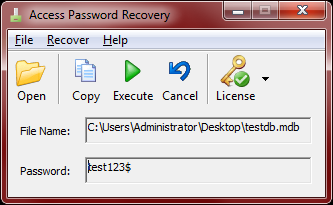 Now Access Password Recovery v2.0 is available, you can feel free to experience it. Please refer its homepage to know more detail.